I was hungry one afternoon, as I am almost always hungry, and decided to go out for lunch. After considering the many options, I went with my local Panera. It was crowded, which is not uncommon, and I stared blankly at the menu determining which of the two or three things I eat at Panera I should get that day. When it was my turn, I ordered the 1/2 a Smokehouse Turkey Panini with a 1/2 of a Baked Potato Soup (more or less my usual order). The woman behind the counter took my order and asked "would you like a free cookie with that?" I had to pause and think about this, not because I wasn't sure if I'd want the free cookie, but to consider why she would even need to ask? Am I really going to say "no, I don't want a free cookie. And I also don't like kittens, rainbows and Christopher Walken." I got my free cookie. With Promise of Blood, Brian McClellan wrote a swords and sorcery Fantasy novel, but gave us a free cookie - gun magic. Yes, I want some free gun magic with my usual. This is a really strong start to a trilogy that has nonstop action - none of this characters stopping to wax poetic for 50 pages - as the world deals with the overthrow of a king, creepy prophecy, and imminent war. 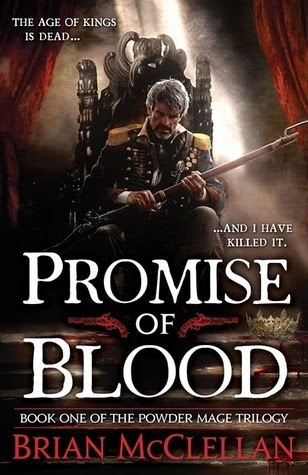 It only took a few pages of Promise of Blood for me to add books two and three to my to read list. 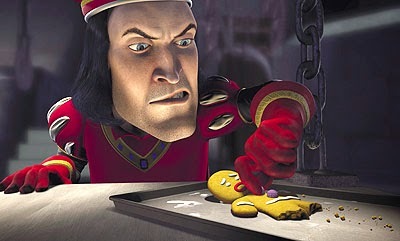 I give it... "not my gumdrop buttons!"